Prof Jonathan Bamber is a professor of glaciology at the University of Bristol and the current president of the European Geosciences Union (EGU). He was the director of the Bristol Glaciology Centre from 2010-14 and is the founder and former editor-in-chief of The Cryosphere, a scientific journal. Carbon Brief: OK, my first question. You started off doing physics at university. What made you become interested in glaciers? Jonathan Bamber: I think I’ve always been fascinated by the natural environment and the world around me. Also, I’m a keen mountaineer, which I think some of my glaciology colleagues are also, actually. I’ve always done a lot of climbing in mountain ranges with glaciers on them. You see these incredible environments – and I always wanted to know how they worked. I think that was one of the drivers. CB: When did you first think of climate change as a big issue and think about how that could come into your career? JB: That’s an interesting question because, when I was doing a physics degree, I didn’t really think about climate change as a high-profile issue that we had to be particularly concerned about at that time. I mean, this was some years ago – early 80s, in fact. Then I went on to do my PhD at a place called the Scott Polar Research Institute at the University of Cambridge. That was a glaciology-geophysics PhD, but I would say that the problems – the questions we were trying to address – were very much what you would call “curiosity-driven”. Again, at that time – early 80s – we weren’t thinking about climate change as a major impact on ice and glaciers. At least, I certainly wasn’t. Then, over the years that I’ve been working in the field, the issues around climate change and also what we’ve seen happen to various parts of the cryosphere – glaciers, ice sheets, sea ice, permafrost, seasonal snow cover, all of it – we’ve seen changes that are unprecedented, certainly in the satellite record. It’s become increasingly more important and a more urgent sort of question that we need to address – and a problem that we need to tackle as a species, as the human race. CB: Do you remember one key paper or one discovery that made you really go: “Wow, this actually is a big problem”? JB: That’s a good question. I can’t think of one key study, but I can think of one part of the climate system where the changes are so dramatic and so large and really, from what we understand from the paleo-climate record, so unprecedented, certainly for the last, let’s say, 1,500 years, and that’s Arctic sea ice. The satellite record is relatively short – it’s only about 45 years – but the changes are so dramatic. The projections are that we could potentially have an “ice-free” Arctic Ocean in summer by maybe 2035-2040, which is potentially in my lifetime, not so far away. That really is incredible. Since we’ve been navigating the seas, we’ve been looking for a Northwest Passage or a northern sea route. Ships are doing that now in summer. To think, how long have we been sailing the oceans? A few hundred years. It’s quite a remarkable change that we’ve seen in my lifetime. CB: When we think about climate change and glaciers, what to you are the key things that we don’t know about them and that we need to find out in the coming decades? JB: Quite a lot of my work now relates to sea level rise and understanding the components of sea level rise. I’ve got a European Research Council-funded project on that over five years. There are various contributions. Right now, the biggest component of sea level rise comes from both glaciers and ice sheets. The potential future largest contribution is from the ice sheets covering Antarctica and Greenland. I think one of the biggest questions that faces people working on ice sheets, in particular, is what might the potential contribution of Antarctica and Greenland be to sea level rise over the next 50 to 100 years. CB: Why is there still question marks about that? What’s hard to figure out about sea level rise? JB: That’s a really great question. The ice sheets are the slowest-responding components of the climate system. They are, if you like, the supertankers of the climate system. Once you send them in a certain direction, they’re going to carry on in that direction for centuries – because their response time to external forces is relatively long. They respond more slowly than the oceans, the atmosphere and everything else. There are parts around the periphery of the ice sheets where they can respond quite quickly, but the whole system – the whole of the Antarctic ice sheet is a whole continent, one and a half times larger than Australia – that responds slowly. One of the challenges for us is that our observational record of what has happened to the ice sheets is rather short. We can look at paleo-climate data, so we can try and infer what the ice sheets did in the past based on paleo proxies for sea level rise over the last 100,000 years or something like that – but that’s a very imprecise measure. It’s an indirect measure of how the ice sheets are responding to external forcing and climate change. So, our satellite record – a high-precision, high-accuracy satellite record – is only about 30 years long. That’s not really sufficient to tell us how they might respond on a centennial timescale or something like that. The other problem is that there are highly non-linear responses of ice sheets to external forcing. We might just nudge them a little bit – and we might see quite a large response over decades to centuries. Identifying those transitions in state from one state to another is quite difficult in climate modelling, in general, when you have what’s called “hysteresis” in the system. That’s one of the reasons. Another reason is that, for example, the Antarctic ice sheet in places is almost five-kilometres thick. We’re never going to know with really sufficient accuracy exactly what’s happening at the bed of the ice sheets, which is a very important boundary condition. If it’s wet, the ice can slip off the bedrock, and flow rather fast and rather easily. If it’s frozen to the bedrock, as it is in a lot of places, then it makes a big difference to how easily the ice can flow. How rough the bedrock is and other characteristics, just basal topography, for example, is something that’s quite poorly known currently. Those are major challenges for the modelling community and for observational scientists in trying to understand ice sheet processes. CB: At the moment, there’s a research vessel on its way to Thwaites. That’s quite a massive project. Why is it so important to understand Thwaites, in particular? JB: Thwaites Glacier lies in an area called the Amundsen Sea Embayment of west Antarctica. That area has been described by colleagues, and this is going back to the 1970s, as the “weak underbelly” of west Antarctica. That area, if you took the ice way, instantaneously, the bedrock that the ice rests on is up to 2.5km below sea level – 2,500m below sea level in places. 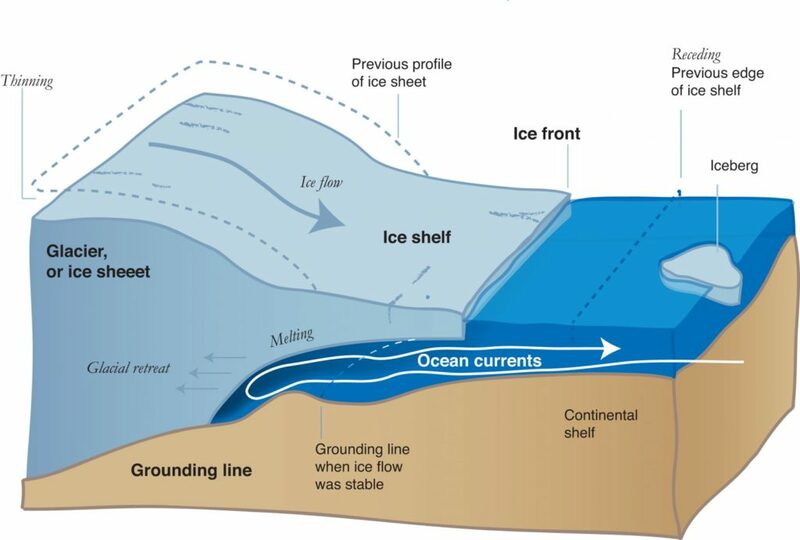 That particular configuration is what’s called a “marine ice sheet” because the ice rests on bedrock below sea level, part of the ice sheet is in contact with the ocean. This is the bit where it’s called the “grounding line” – that’s the point where the ice becomes floating and starts to interact with the ocean. If the oceans warm, that underbelly, the underneath of the ice sheet that’s in contact with the ocean, is going to start melting. The grounding line that I just described, that’s going to move further inland. There’s good evidence to suggest that that inland migration of the grounding line is a relatively unstable process. When it’s resting on bedrock that’s sloping inland, getting deeper inland – that’s potentially unstable. So, you could get quite a rapid migration of that grounding line. Thwaites Glacier and Pine Island Glacier and several of the others in that inland area called the Amundsen Sea Embayment, they’re all resting on bedrock sloping inland. Thwaites is one of the biggest. 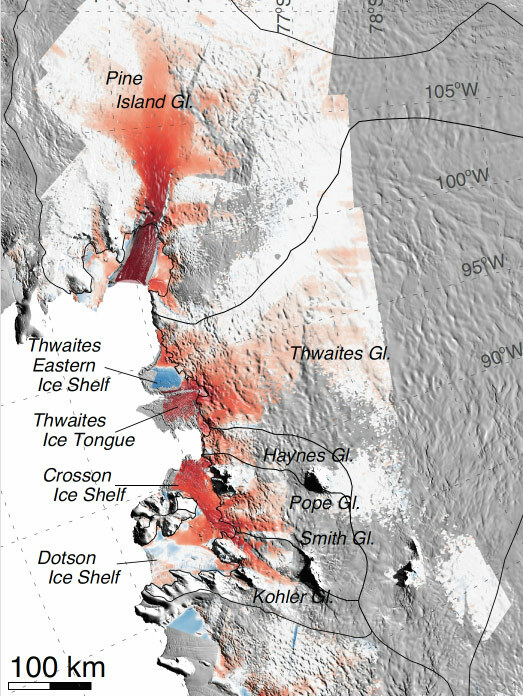 Pine Island and Thwaites are about the same size in terms of the amount of ice they’re discharging into the ocean, so they’re really important for our understanding of what marine ice sheets might do and potentially for future sea level rise. CB: There was a report out this week about the Himalayas and Hindu Kush region, finding that a third of the ice there would melt at 1.5C and, under a “business-as-usual” scenario, two-thirds could go. Why is that region so sensitive to increases in temperature? JB: I don’t think it is, particularly. I don’t think it is more sensitive than any other bits of ice on the planet. If you warm the planet, ice melts. It’s as simple as that. Actually, I think there are some other areas, in particular the high Andes, the tropical Andes, are very sensitive to small changes in temperature. There are mountain ranges around the world where the glaciers will almost completely disappear by 2100 for a business-as-usual scenario. The Himalaya Hindu Kush – HKH – is often described as the third pole. Outside the polar regions, there’s more ice there than anywhere else. It’s like all these mountain regions where you have ice. It’s sensitive to small changes in temperature. You only have to turn up the thermometer a little bit and you’re going to melt a lot of these glaciers. They’re frozen water and they are melting now. There is snow accumulating in the interior at high elevations, but they’re very sensitive to small changes in temperature. I think another reason that the glaciers in that area are particularly important is because they are the major water source for people living downstream of them. There are some conflicting numbers that you might see in the literature about how many people are dependent on glacial water from the HKH, but it is a large number. It’s millions. CB: Late last year, the Intergovernmental Panel on Climate Change (IPCC) released its special report on 1.5C. Do you personally think 1.5C is still possible, to limit warming to that measure? JB: That’s quite a difficult question because it really entirely depends what we do in the next few years. Really, it’s just a matter of years. There’s an organisation called “Mission 2020”, which is trying to push for us to tip the point where CO2 emissions decrease from 2020 onwards. They’ve done a lot of calculations to demonstrate that that’s a critical point. Really, if you leave it any later, then there’s absolutely no chance or very, very little chance. We would have to take really strong measures, for example, like extracting CO2 out of the atmosphere – carbon sequestration technologies, if we want to avert exceeding 1.5C after then. It’s a difficult question to answer in the absence of really having a crystal ball and knowing what we’re going to do collectively over the next five years or so. I think I’m relatively optimistic in the sense that I think it’s still possible. It’s not beyond our capability as a species to tackle this, but we have to take action – really profound action – and we have to take it collectively, and we have to do it soon. The challenges are really significant. They’re deep. They require action by pretty much all nations, particularly Western nations who have the capacity to support other countries, developing countries, in reducing their carbon emissions and mitigating and adapting. It’s not impossible, but it is extremely challenging. CB: One finding of that IPCC report is that global warming of 1.5 or 2C could trigger changes to the cryosphere that could potentially lead to “multi-metre rise in sea levels over hundreds of thousands of years”. Do you agree with that? Where does that finding come from? JB: There are two quite different thresholds. The Greenland ice sheet is a relic of the last glacial period, which ran from about 130,000 years ago to 12,000 years ago. There’s this thing called the “small ice cap instability”. What that means is, as you warm air temperatures, you’re going to melt some ice and the surface of the ice sheet is going to go down a little bit. The air temperature goes up as you go down – so that’s a positive feedback. In other words, as the surface lowers, it gets warmer and more melting takes place. Colleagues have done some estimates of what the critical threshold is at which point this small ice cap instability is passed and the point at which the ice sheet is no longer sustainable. That is around 1.6-1.7C. There is some uncertainty over that. It depends on, for example, the seasonality of the temperature changes and the seasonality of changes in precipitation, because they’re important – but it’s around that mark. Once you pass that and what’s called the “surface mass balance” – that’s the balance between melting around the edges and snow falling in the interior – once that becomes negative, the ice sheet is on its way out. That’s one of the thresholds. The other one is this thing that I described earlier about west Antarctica called the marine ice sheet instability. It’s a little bit harder to know what the temperature threshold is there because that’s not driven from the surface, it’s driven from the oceans. But we know that ocean warming is going to cause increased migration of this grounding line and that we could pass a threshold there where the grounding line becomes unstable and just moves inland until all the marine sectors of west Antarctica are basically floating. There were some papers published about three years ago that suggested that we may even have passed that marine ice sheet instability threshold already for parts of west Antarctica. However, I think the key there is not “have we, haven’t we” – it’s all about the rate. Because, we’re a very ingenious species, we can come up with all sorts of smart solutions for all kinds of problems. If the rate of sea level rise, the contribution of the ice sheets, is modrdest, very small, let’s say a millimetre a year, which is roughly, crudely, what it is now, that’s 10 centimetres a century from the ice sheets. That’s something we can deal with. That’s a rate that we can mitigate against and we can tackle. If it’s 10 times larger – for example, a centimetre a year, which various studies suggest is not impossible – then that’s a metre a century. That’s going to be a lot more challenging for us as a society, as a species, to deal with. 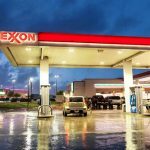 I think although in some of these studies they do focus quite heavily on these thresholds – these critical thresholds – and they are important, I think even if we pass a threshold, there’s still a lot we can do to reduce the impacts of sea level rise and the melting of the ice sheets, irrespective of those. So, hope is not lost, if we think a critical threshold has been passed. It’s all a question of degree. The actions we take over the next decade are going to have big impacts on all of those numbers. CB: We’ve already touched on this briefly, but the IPCC report talks about the need for some degree of negative emissions in order to reach 1.5C. What’s your view on using negative emissions and the role that they could play in making it to 1.5C? JB: I think if we want to stick to 1.5C, some form of negative emissions technology and approaches is going to be needed. That’s clear – because we can’t wean ourselves off fossil fuels tomorrow. It’s not possible. We are going to have to transition to a low/zero-carbon emissions economy over a period of time. I think if you look at the technologies that we’re reliant on, that is going to take years. Multiple years. So much of our economy is reliant on fossil fuels in some form or other – I mean from agriculture, through to transport, through to heating. That transition to alternative forms of energy source, for example, livestock, and fertilisers, everything, cement, everything that we do – it’s a big challenge. I think without these negative emissions, it’s going to be an awful lot harder if not near impossible. CB: What are your thoughts on solar geoengineering or solar radiation management? JB: Solar geoengineering is one form of geoengineering. There are other options. They’re all kind of related. For example, we could seed clouds, which is a form of solar geoengineering – or [we could release] sulphur aerosols to reduce the amount of solar radiation hitting the surface, and so on. I think it’s important that we explore all possible options for tackling this really profound and super-challenging problem that we face. One has to be very cautious about tinkering with the climate system because of the potential unintended consequences. I think, unless we’re really quite confident and certain about what the other impacts might be from different forms of solar geoengineering on things like patterns of precipitation and storm tracks and the rest of the climate system, it’s a little bit of a risky approach. I think it’s really important that we look at that as an option and understand what it might be able to do and what the potential consequences might be of those sorts of approaches. I think we shouldn’t just dismiss it out of hand, for sure. CB: What are your thoughts on the special reports of the IPCC in general? Do you think doing special reports in addition to the assessment reports is useful? JB: It’s definitely useful. I think the special report on 1.5C has really added momentum to a sense of urgency and the need to take action, deep action, and to do it soon. I think these special reports are really valuable. Some of my colleagues have argued that the IPCC assessment reports, those are the ones that take place every seven or so years, the really huge documents, tend to err on the conservative side when it comes to certain statements. I think that’s possibly a valid criticism. I think that’s the nature of the exercise – that they can only report the consensus of what the literature actually says. CB: Later this year, there’s a special report coming on oceans and the cryosphere. What are you hoping to see in that report? What are likely to be the main advances since the last assessment report? JB: There’s been so much. In fact, just this week, there have been some really high-profile papers, some of which we’ve talked about – the big report on the Himalayan Hindu Kush. There have been a couple of papers that have come out in Nature, just today in fact, on the Antarctic ice sheet. This is a revised estimate of projections of what the Antarctic ice sheet might do and also what the potential feedbacks between the melting in Antarctica and the climate system might be. I think we’ve learned an awful lot in the last five years or so since the last assessment report, which was published in 2013. Really, a lot of major advances. I think we realised at that time that, although we’d made significant progress in understanding how the cryosphere responds to the climate system and those feedbacks both ways, positive and negative, we also realised that there were quite a lot of gaps. The community has been working very hard to fill those gaps and understand things that were left a little bit hanging in the last assessment report. I very much hope that this special report on oceans and the cryosphere will address many of those hanging questions and we’ll have improved, revised, and more comprehensive assessments of, in particular, what the ice sheets might do, but it will also be glaciers and ice caps. And not forgetting really critical other parts of the cryosphere, such as permafrost. There’s a big question over Arctic permafrost. Permafrost over the surface – that’s the frozen ground – almost all of that is in the northern hemisphere and locked up in that permafrost is a lot of carbon. In particular, when it melts, we believe most of that carbon will be emitted as methane, which is a much stronger greenhouse gas than CO2. So, there are some real questions over the potential positive feedback between permafrost melt, methane emissions, and increased temperatures. Sea ice has a strong positive feedback. As it melts, it opens up more very dark ocean, which absorbs more solar radiation and warms the Arctic Ocean. We’ve seen such big signal in the Arctic sea ice in the last few decades, so that’s really important. Seasonal snow cover, as well, has the same effect. It’s an insulator. Snow is the brightest natural surface on the planet. In other words, it reflects more radiation out into space than any other natural surface. If you reduce it, you have the potential to warm things up even more. These interactions between the cryosphere and the rest of the climate system are really important. I think that this special report will find a lot more intelligence on those sorts of feedbacks and how important they are in terms of maintaining a stable climate going forward. CB: A lot of your work uses satellite data. From the span of your career, how have satellites improved and changed? Also, looking forward, what more changes and improvements are we looking to have? JB: That’s a great question. Satellite remote sensing, which is largely what I do, it’s the majority of my work – it’s a very young science. It really only took off in the early 60s. The technology has advanced so much, beyond our imagination. In 2002-2003, NASA launched the first ever spaceborne laser altimeter system called ICESat-1. They have just launched, in September last year, the replacement for ICESat-1, called ICESat-2. That kind of technology is just incredible. The sorts of information that we’ve been able to obtain from satellites like ICESat and European Space Agency satellites like the dedicated cryosphere one, called CryoSat-2, has really remarkably improved our understanding of what the cryosphere is doing. Another one I should mention is called “Grace” – the Gravity Recovery and Climate Experiment. That’s a totally different kind of technology. It’s actually measuring changes in the gravity field of the Earth, which has also given us incredible insights, just in the last 15 years or so, into how mass is being redistributed on the surface of the Earth due to changes in climate and solid Earth processes. Really, I would say, I’ve been so lucky in my career because there’s been a revolution in our ability to observe processes at the surface of the Earth and even below the surface of the Earth from satellite remote-sensing techniques. I think it’s incredible and I always marvel at that kind of technology. It’s things like that that have given me hope that actually we will find solutions to this incredibly challenging problem of climate change. CB: This year is your last as EGU’s president. Can you explain how you become the president of EGU? What’s the process of that and what does your role entail? JB: I’ve been involved with the organisation since about 2000. That’s quite a long time. Almost 20 years. Back in 2000, it was called the EGS and then it merged with another organisation to become EGU. My direct involvement with organising the meetings and the publications and so on tailed off a little bit. I launched a journal called The Cryosphere in 2007 and was the editor-in-chief of that for quite a few years, but wasn’t really directly involved in managing the EGU for some years. Then I was approached by the executive board, the management of EGU, to see if I was interested in standing as a candidate for president of the organisation. This is honestly the case – I had not given it any thought whatsoever prior to that, but they approached me and I gave it due consideration. I feel it is a really important role to have. It’s giving something back to the community. It’s helping the geoscience community do what they need to do and improve our understanding about how the planet works and other planets as well, in fact. I was really quite honoured to be asked, so I put my CV forward. There was an election with, I think, several candidates standing. I was elected president back in, I think, 2016. Then I was president-elect for a year, so kind of learning the ropes and understanding – reminding myself how the organisation operates and functions. Then I’ve been president for about two years and then I stand down, and become vice president and take on that role as advising the incoming president. It’s been fascinating. I mean challenging in its own way, of course, as you’d expect. The council each year is about 35 people, roughly. When you have 35 scientists together, you have at least 70 different opinions about things. It’s been a rewarding and challenging exercise in moving the organisation forward. I think we’ve done a lot of good work, actually, in the last few years. I’m really pleased with the direction that the EGU is going. I think it’s got a really, really great future. CB: What kind of legacy do you think you will leave behind there? What’s the mark you have made on EGU? JB: There are two things. I remember this in the manifesto – my statement that I put forward when I stood for election. There were two things. I wanted to promote and encourage activities related to what we call early-career scientists. Those are people roughly seven or eight years from their PhD. I think we’ve done incredibly well with that, actually. It’s not just what I have done because we’ve been working towards that for years now, but I’m very proud of the fact that, when we surveyed our attendees at the general assembly, over half declare themselves as early-career scientists [ECS]. I think that’s brilliant. We have, for example, initiatives. We ensure that in each session that’s organised, and we have about 700 different sessions, that there is at least two ECS speakers, so that it’s not just the usual suspects who are asked to give their talk. There are various other ways that we’ve promoted early-career scientists within the organisation, and I think that’s been a great success. Another area that I wanted to develop was our interaction with policymakers and the policy side of the organisation. I think that’s also going very well. We had what we called a dinner debate in Brussels last October, and we’re planning another one for this year. I think that they have been great ways for us to provide some insights into what the geosciences community can offer policymakers and the policy community and the kind of things we do. CB: Some environmentalists and scientists say that some conferences like the EGU general assembly should consider going virtual, or trying to be more virtual, in order to lessen the climate impact. What’s your view on that? JB: We’ve thought really hard about this one. It is a concern. It’s something that we are very aware of and do not take lightly. We’ve taken a number of measures to reduce the carbon footprint of the meeting itself. That’s working very closely with the organisation that runs the conference centre, which is called the Austria Centre Vienna. We have worked quite closely with European rail companies to offer reduced rates on rail travel to the meeting. That happened last year. We have introduced a carbon offset scheme where, when you register, there’s a contribution from the registration fee that goes towards carbon offsetting people’s travel. Although we’re not saying that’s a total panacea, it is helping to reduce the overall carbon footprint of the meeting. Should we go entirely virtual? Last year, we had 15,500 participants. It’s pretty much impossible to hold a meeting with that number of people [virtually]. I think there will always be limitations to having virtual meetings simply because of the bandwidth, the bandwidth of your Internet connection, basically. But we are actively discussing ways that we can put more of the meetings webstreamed, for example, or online, or offer some virtual solutions – but it’s quite difficult to do. Why do people go to these sorts of meetings? I think there’s a range of reasons. One of the biggest is because it’s a really excellent networking opportunity. To make progress in some of the grand challenges that we’re facing in the geosciences, these really big problems, it doesn’t take one individual. It takes whole teams and you need to have this exchange of ideas. It’s absolutely central to progress science. There are two primary ways that you communicate science to your colleagues. It’s through publications, which we also do, of course. We are one of the pioneers of gold open-access publishing in the geoscience community. The other is through conferences. I think that we are very aware of the carbon footprint of the meeting and the fact that almost everybody that attends the meeting has travelled by some means which involves fossil fuels. Even if it’s not flying, even on a train, it may not be renewable electric. CB: In your role, you must have worked in collaboration with scientists from all over Europe. Has that given you some idea of how Brexit could impact how climate scientists work? JB: Do we really have to discuss the “B word”? There is no getting away from the fact that Brexit is really, really bad news for science in the UK and science in Europe. Science absolutely benefits from collaboration. The fantastic thing in particular about European Commission funding instruments is that it’s one of the very few ways that you can have a coordinated research programme across national boundaries. It’s very difficult to do it in other mechanisms. For example – my funding – the funding agency I use primarily is called the Natural Environment Research Council. They have a bilateral agreement with the National Science Foundation in the US – but that’s bilateral. I was working on an EU-funded project which had, I think, 25 different partners, most of those in Europe, but actually a couple in South America, as well. I think to lose that capability is going to be bad for us, bad for scientists in the UK and bad for European scientists as well. I think it’s really a tragedy, actually. Not just from the funding point of view. It’s also from mobility of labour, as well. Although we’re not suddenly going to put up these border walls or limit the way we potentially can work in other countries – nonetheless it is going to make it more challenging for people to move here. CB: Do you think that will have a noticeable impact on research? Do you think people will be able to notice a difference after Brexit? JB: We’re already seeing some of the impacts in terms of EU funding calls. There are some statistics that have been produced that show a dip in the number of UK partners being approached or being included in EU funding rounds. You could say: “OK, well, will that have some impact on the quality of science that happens in the UK and Europe?” That’s a bit harder to actually put numbers on, but, in principle, I think absolutely yes, because we all benefit from collaboration and removing the opportunities to collaborate will just make things harder and more difficult and more insular, which is absolutely not the way we want to go. CB: My last question is on science communication. What do you think climate scientists tend to get right and wrong when they’re trying to communicate their science to the public? JB: That’s so hard to answer because, to answer that question, I would have to really generalise about all climate scientists. I think there’s a number of things. I’ve heard, particularly, a number of policymakers quite often say, “you should be out there doing more communication with the stakeholders”, which includes the public, but also policymakers and decision-makers in government, for example. I think that that’s not an entirely fair criticism. A lot of us spend a lot of time talking to those kind of people, but it doesn’t suit every scientist. Some are good at that and some aren’t. Some are brilliant verbal communicators and can get messages across in incredibly effective ways and others, not so well. I think we need to play to our strengths. In terms of the things that sometimes we get wrong, I think that a mistake that we’ve made as a community is attempt to scare, in particular, the public into taking action. “This is going to be so awful, so terrible, that we have to do something about it right now” – because I think that in terms of the psychology of the problem, that just doesn’t work at all. If you try and scare people into action, it’s a very ineffective approach. I think also talking too negatively, it just becomes overwhelming. “This is just such a big problem. There’s nothing I can do about it. I’m just going to ignore it.” I think we have to be very cognizant of that. But many of my colleagues are, I think they realise those sorts of issues and actually find very positive messages about action at an individual level but also at a state level that will be good for, let’s say, the UK economy, society the environment. It’s a kind of win-win scenario. I think those are the kind of positive messages that we need to get out there. You look at Denmark, for example. It’s a world leader in wind technology now. It’s a big success story for them. I think there’s a whole range of areas where the UK can take a lead, particularly in things like wave technology. CB: OK. Thank you very much, Jonathan, for your time. The post The Carbon Brief Interview: Prof Jonathan Bamber appeared first on Carbon Brief.